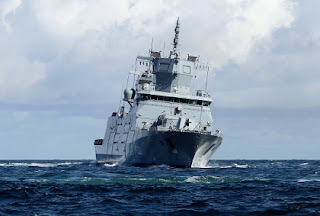 Germany's much-delayed new frigates, built by ThyssenKrupp and Luerssen for at least 650 million euros ($710 million) apiece, are overweight and float with a persistent list to starboard, according to a confidential report seen by Reuters. The ships, designed to need a crew of only 120, less than half their predecessors, are a crucial element in Germany's plans to beef up its military to face an increasingly uncertain European security landscape and a more assertive Russia. Designed to remain at sea for far longer than the German armed forces' existing fleet, the new F125 frigates need extensive servicing only once every two years, compared to once every nine months for their predecessors. The 1.3 degree starboard list and excess weight, which emerged during testing in September, means the ship is now close to the limit of its design parameters and will raise the class's lifetime maintenance costs by around 20 million euros, according to a confidential annex to a regular German defence ministry report. A defence ministry spokeswoman declined to comment on the confidential report, but said "in general terms" that the development of the four ships, the first of which was to have been delivered in 2014, remained on track. Problems seem to stem from two primary factors: the move in 2011 to double the submarine construction rate from one to two per year has strained shipyards and the industrial base that supplies parts for the subs; and the Navy has successively reduced contractual building times as shipbuilders grew more experienced with building the submarines, cutting back on earlier, highly-trumpeted opportunities to beat deadlines. Looks like it is listing to port. Perhaps a mirror image? I think it's in a turn. I thought the Burke's had a pretty good on time and cost building record? Pretty much, but the new classes of ships DDG1000, LCS, etc had some teething issues.